My first solar eclipse was in sixth grade. Our science teacher, Max – I went to a progressive school where we called our teachers by their first names, so I actually had a real science teacher named Max – took us outside and we sat in the grass, next to a blacktop, near the soccer fields. In groups, we held something up in the air and peered through it, a notecard with a hole in it, or something like that. I don’t recall exactly. The entire memory is just an image of us, kids, sitting by the blacktop, holding a thing up in the air and squinting. I found it rather tedious. My second solar eclipse fell on the festival of Maghe Sakranti. Before the solar eclipse, there had been a number of times when Maghe Sakranti had coincided with the day of my departure from Nepal, so over time, during visits when I found myself still there for this festival, Maghe Sakranti and its associated rituals had taken on a special flavor of celebration. We were still together. In the days leading up to the eclipse, I was at school from early in the morning right up until dusk, painting. 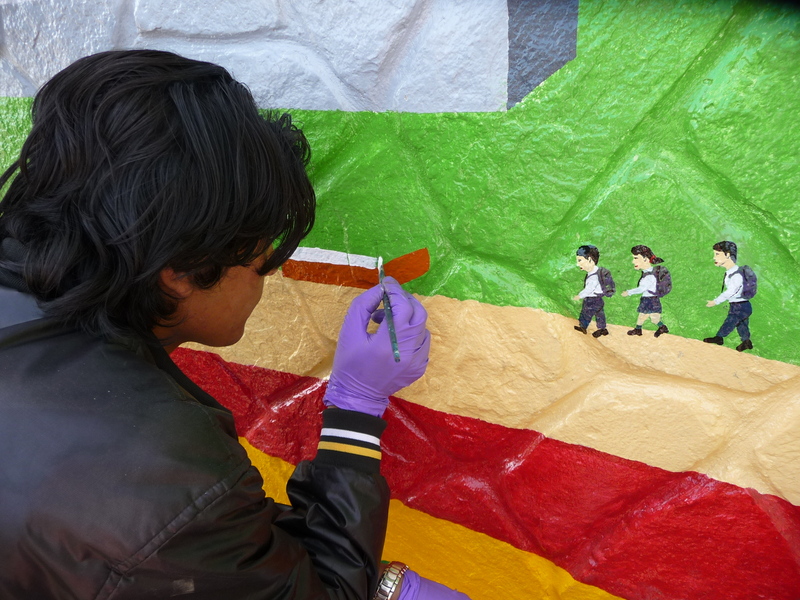 Govinda and the kids and I were rushing to finish a mural before yet another departure. 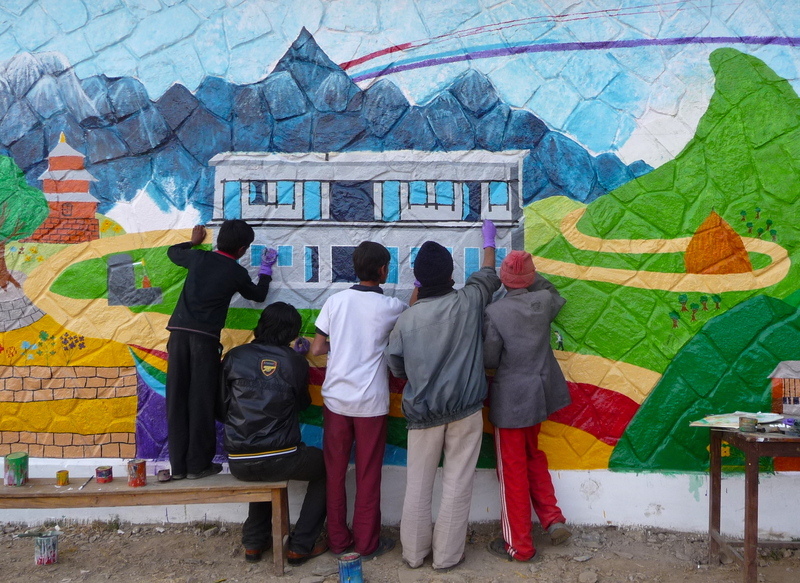 It was a picture of their community: haystacks and houses, the whipped-cream shaped Kalika Hill with its little temple at the top, a paraglider sailing overhead, and road winding around from one place to the next, with a dominating school at the center. As the day of the eclipse approached, there was a great deal of anticipation. Everyone was talking about it. Once, Aamaa said, she’d been out during a solar eclipse and, just like that, it had turned to night. They’d been forced to wait for a few hours until it got light again so they could go home. Now that was something I wanted to see. I went to visit Thakur sir, the astrologer, to get his opinion on a gift. Back home, a great healer and teacher of mine was losing her eyesight. I had purchased a necklace with the symbol kali chakra on it, and I wanted to ask about taking it up to the temple to be blessed, or infused, or something of that sort. I wasn’t exactly sure, but I thought Thakur sir would know what I meant to ask. A solar eclipse, he said, would be a very auspicious day to bless a necklace, even though it wasn’t allowed to do a puja during the hours of the eclipse itself. And, once the necklace was up there at the temple, at the top of the Kalika hill, I couldn’t take it away until the eclipse was over. The movement of necklaces was one of many things couldn’t happen during the eclipse. Everyone would fast, of course, from exactly 12:36pm to 3:30pm, and many people would fast the whole day. Any water in the house would have to be poured out after it was over, and replaced with fresh water from the tap. It is wood cutting season, and trips to the forest were put on hold for the day. And Maghe Sakranti was, for all intents and purposes, cancelled. In the U.S., a solar eclipse is, for the majority of busy people, a science project for kids. But here, where astrological charts are consulted for even the opening of businesses and choosing of brides, everything seemed to slow down as the days spiraled towards a grand and humbling halt. Gazing at the top of the Kalika hill against the sky, I could feel the world catapulting through the solar system to a particular magical position—a great thing getting closer and closer to us, small people, standing where we would witness the movements of the galaxy. By the prior night, there were three buses waiting to take people all the way to Chitwan in the morning so they could bathe at the place where the Trishuli, Gandaki and Kali rivers meet. First thing in the morning, Aamaa repainted the floors with a fresh layer of mud. It would be a day filled with ritual. Like the rest of the world, I had hoped to stay put for the solar eclipse…but the mural wasn’t finished. We had painted and painted that week, trying to finish in time, but when we pounded the lids in to the tops of the metal paint canisters the night before what should have been Maghe Sakranti, our creation still wasn’t complete. So I departed for school early in the morning, swearing to Aamaa I’d be back by noon so that I could eat before the fast. I met Govinda in the road with the necklace in my pocket. When I’d taken it out that morning, I’d been surprised to see how mysterious and powerful the kali chakra looked, separated now from the rows of silver and symbols in the glass case at the shop. When we passed Thakur sir’s house, I put it in his hand and he gave it a long look. I wasn’t sure if I’d actually end up giving it to my teacher back home. I thought I’d send it up to the temple during the solar eclipse, and then give it away later if it seemed appropriate. I was afraid it might seem kind of silly, and ridiculously enough, decided I would ask the priest at the temple for an opinion when I went to retrieve it later; after the solar eclipse. Govinda and I arrived at school to find the kids waiting anxiously, and out came the paint. 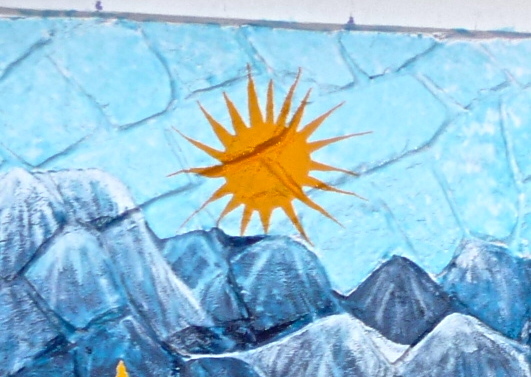 I had stayed out past the witching hour, painting a mural, many times over my years in Kaskikot. But there was no thought of that today, not in the quivering air, under the glare of that acute collective focus on the cosmos. I was incredibly excited. It felt huge and magical and a little ominous, and made me think about what it must have been like for ancient cultures that didn’t know the science behind such events. It must have been incredulous and awful to see the sun – so reliable! – disappear in the middle of the day! And that’s how we found ourselves rushing to complete our masterpiece before the stroke of noon, small people painting small people, the sun under the brush racing the sun circling in the sky. “The eclipse is coming!” passers-by admonished us. What were we doing out? At 11:15, we decided we were done, and with terrible haste threw remaining paint in to boxes, picked up old gloves, ran and locked the office, forgot something in the office (Unlock the office! The eclipse is coming!) and, at last, set off running down the road to get home before the eclipse struck us dead in the road. Kids peeled off at their homes. As we raced by in the dust, people called to us from their houses: Hurry! The eclipse is coming! There had been conjecture that we would see stars. The entire world was about to evaporate. I made it home by noon, in time to eat. One o’clock in the afternoon, twenty-four minutes after the official start of the eclipse, brought a subtle change in the quality of the light. Bhinaju and Bishnu and I decided we would climb up the hill behind the house and watch from the resort. We set to discussing what we should bring along. A flashlight? Poncho? Extra sweater? Rubber bands? Camera? (Would it be too dark for photos?) We rummaged around and put some belongings together. We climbed up to the top of the hill. 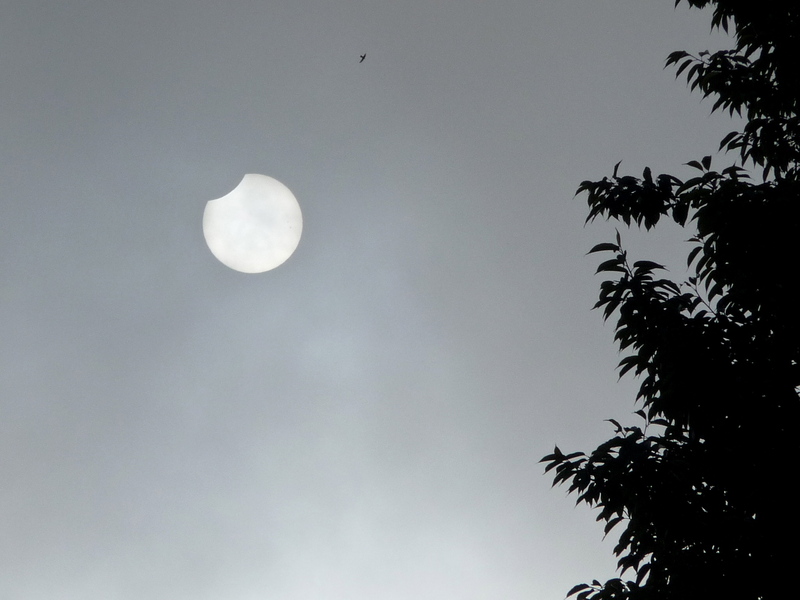 And there I was, surrounded by a Himalayan panorama during a solar eclipse! I wondered if I would be permanently altered, perhaps suffused with some kind of wisdom? We sat in the grass. We waited. We stared earnestly at the sun for 30 minutes before admitting that we could see nothing. We came home and sat on the porch. It was a devastating disappointment. I took out my journal. I became impatient for tea. 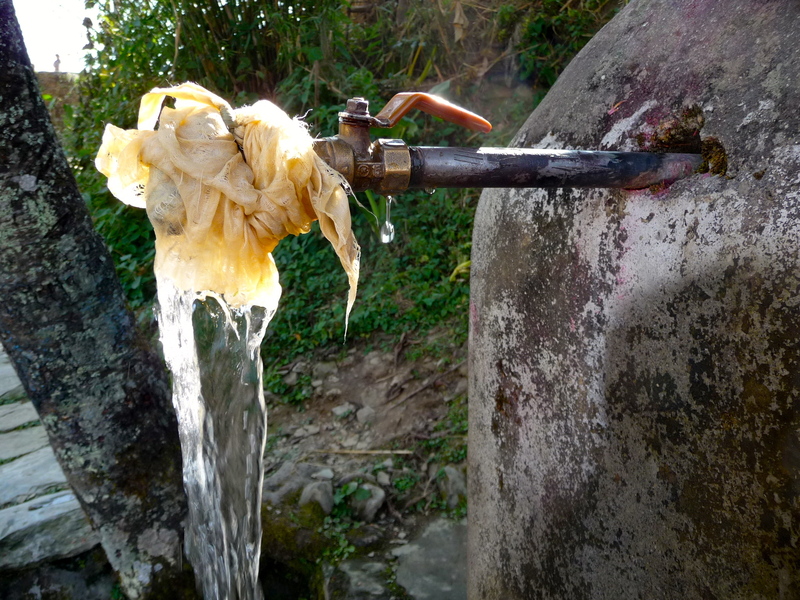 As I looked a the water vessels and thought sullenly that we’d have to fetch new water before we could make tea, I considered the idea of “touched” water – that’s the word, chueko, “touched” water, the same word used for the impurity that a menstruating woman imparts to the things she contacts – and it occurred to me that all of these rituals – abstaining from pujas, fasting, dumping touched water – were fundamentally based in a fear of the awesome, not a celebration of it. Too bad I wouldn’t see anything. Even Maghe Sakranti had been cancelled. For some reason, some of Aamaa’s old, beat-up x-rays were lying in a large envelope on the porch. I have no idea why. She’d had them taken when she was first sick, eight years ago; one of the slides showed her ribs and abdomen, a faded spine in the background, and another, a ball and socket joint. Maybe they’d been deposited in this random location during a recent tidying, or while we’d been arranging articles to bring on our failed observation mission an hour earlier. I was writing when Bhinaju suddenly said, “Laura, come here.” He was standing in the yard, holding up the ribs and studying them. I thought he wanted to continue a recent debate we’d had about the number of vertebrae in the spine. “Why,” I mumbled. “Vertebrae?” I was in no mood to be proved wrong. “Just come here.” He switched to the ball and socket. I got up and went to stand beside him. And right there in Aamaa’s humeral head was a clean outline of the sun with a smooth bite out of the upper left-hand corner. We spent a very long time waiting for the milk truck to pick us up. As part of Optional Class, I’ve found people to come up from the city and tell the kids about their jobs: a librarian, a radio jokey, and someone from the photo shop. Today, we were headed to Pokhara to visit the places they work. While we waited for our ride, the kids sat on the grass, leaning on each other, practicing the song that Govinda and I wrote about the solar system. We make them sing it every day – Venus has poisonous air, there’s a big storm on Jupiter, la la – so the tune has more or less become the Optional Class Anthem. The radio jockey had invited our students to sing the solar system song on air during our visit, and the quartet selected for that job was practicing next to a few other students who we’d chosen to read their poetry on the radio. The early morning hour was one of quiet satisfaction for Govinda and me, watching our kids with their heads bent over the books they’ve made, feeling important. 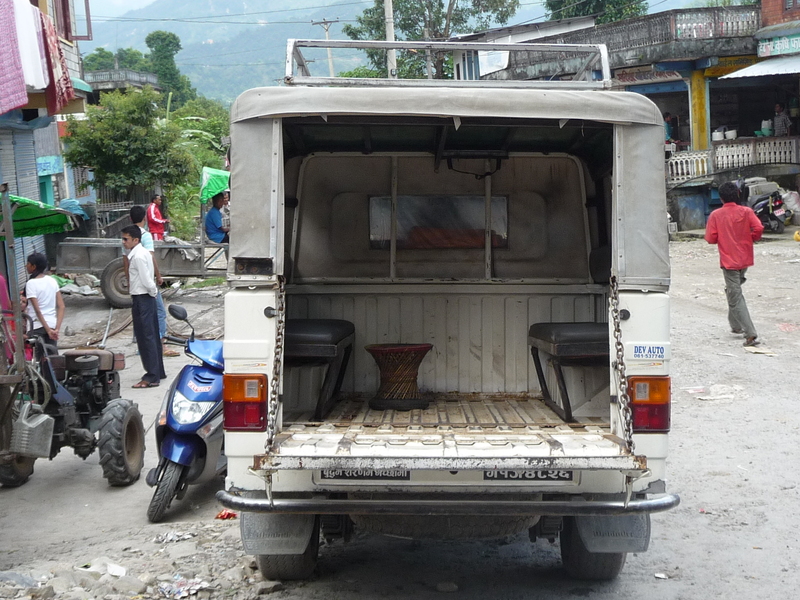 The milk truck finally came, and we all crammed in to the back: Govinda, Laximi, and eighteen kids, and me. The inside was a military-style canvas box with two benches and railings on the ceiling to provide handholds. With a lurch we set off, bouncing down the dirt road toward the city. To keep out the dust from the road, we had all the canvas flaps down over the back and side windows. I looked around at all the little faces squashed into our sealed box, and was struck with the sudden feeling that nothing, no words or photos or documentaries, would ever be able to recreate that stuffed space. At the end of the day, we will be exactly that: a giggling ring of faces pressed together inside our container, moving along a dirt road towards something, out into a world which sees us as if from above, tiny on the crumpled earth. The instant reels in my mind from its birds eye view, and I look from the inside out, where we are now, and fall on the moment with a surrendering crush of love. Because the outside is moving, moving, always crawling along the road, but the inside—the inside is still, aside from the bouncing. With the windows covered we couldn’t see the road going by, or the place we’d come from, or where we were headed. And when I considered that we would eventually arrive, and get out, and be outside too, I felt the weight of a universe crammed into a milk truck. This is our now: the gravity of all the past and future collapsed into a present that will pass and forever be gone. It seems almost impossible, amazing, to be here now. In a milk truck, with these kids. A flat rock about the size of a medium pizza, I figured, would work nicely. I arrived at Sada Shiva half an hour early carrying my stone. Last week, we installed a water hose that is propped up on a stick where the schoolyard drops off and slopes downhill. It’s a great setup, except that in order to use the waterspout, you have to stand on the hill, which is gradually eroding under the constant stream of water splashing out of the pipe. I had decided to improve things by wedging a rock into the hill, so that at least one small pair of feet could find purchase on the muddy slope. Setting my bag down outside class three, I climbed over the edge of the yard and scooted down to where I could crouch below the water spout. Using another rock, I began chipping away at the hill. It was peaceful in the deserted yard. I looked up to see Sunil and Hari looking down at me. “ARE YOU BUILDING A WATER TAP?” They always talk in capital letters. “Yes,” I said, although it seemed generous of the boys to elevate my stone to a “tap.” Without further discussion, Sunil and Hari disappeared. I began chipping again. Overhead, Sunil and Hari were leaning over the edge of the yard, holding two wide, flat rocks. “MISS!! !” Krishna came galloping up behind them with a third rock. I looked down at the small stone I was using to whittle away an indent in the hill. Things were not going according to plan. When I looked up all three boys had left their three stones and gone off again. “MISS!!! !” Madu and Ganga arrived. More rocks. Five minutes later, students were coming out of the woods, like elves, by the dozens. Their stones piled up at the edge of the yard. I was impeached, moved aside, and replaced by Ganga and Madu, who began wedging the stones into the hillside where I had been standing. Rita-Madam arrived and squatted at the top of the slope, looking down at us. Her ponytail rolled around to the front of her shoulder. “Thik, thik,” she murmured. Good, good. More rocks marched out of the woods. Ganga and Madu shouted up to Hari, who passed them down. It was not eight minutes before the students had built a neat ledge where the water splatted onto a flat rock, sending up fine celebratory drops that leapt into the grass. Just to show off, they’d created a few steps leading down to the tap from the yard. There were still five minutes to spare before morning line. That, I thought, is what I meant. “Thik, thik,” Rita Madam said. We climbed back up to the yard and they scrambled into place for morning exercises. Govinda arrived and initiated the daily yard routine. I went into the office, where everybody had taken up their normal posts: by the table, with the comic book, quietly off to the side. Rita Madam rang the bell, and the day began. I had heard that there was a small school in the woods, facing south, far below the road that cut through Kaskikot along the mountain ridge. On a late fall morning in 2002 I went looking for it. I followed a descending path of broad stones as far as the village mill, and from there I turned onto a winding footpath that halted and dropped and navigated roots in the ground and in some places seemed to disappear entirely. Soon I heard no sounds except the whir of the trees and the suggestive rustle of an occasional monkey in the tall grass. I passed a spring and a temple. I came around a bend. And then, demurely, as if waiting for a visitor, a stone wall appeared in a clearing up ahead. I approached the building and emerged from the hushed woods into its open yard, a bald mound of dry dirt looking out over forests and terraced fields. The view extended all the way down to the valley floor, but the school ground still felt hidden among the trees. There were two piled stone buildings with wooden shutters and doors, most of which were missing panels, the gaps blocky and conspicuous like missing teeth in the open-jawed windows. I peeked in to some of the classrooms and saw benches sitting mid-wobble on the dirt floor, facing blackboards whose still-fading scribbles bespoke prior lessons. These objects regarded each other diplomatically, as if ready for anything but expecting nothing soon. When I’d left the United States, I hadn’t decided where I was going to end up. China was a leading contender. I was offered a position in a school with 2000 students. My mother didn’t want me to go to Nepal—there was an insurgency happening. I didn’t know anything about any of these places. I didn’t speak Chinese, for example. I spoke French. I was a terrible candidate to do any reasoning on the topic. 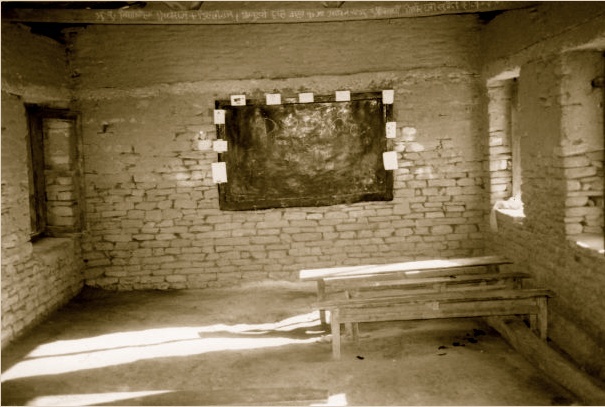 One day, in Bhutan, I was sitting still doing nothing except worrying about where I was going next, when, with as little ceremony as a tenant entering his flat, a picture of a small classroom floated in to my mind and landed there. To this day I can’t explain why, but I knew that classroom was in Nepal. I was going to Nepal. I wound my way back through the forest, past the spring and the temple and the mill, and up a different set of ascending broad stones, I emerged again onto the wide bus road along the ridge. Directly across from me a man was sitting in front of his house on a low wall. He was wearing simple brown pants and a V-neck sweater over a long sleeved shirt, and chatting with a round-bellied man dressed in the clothing of a Brahmin priest. The two men called me over and asked when I had arrived in Kaskikot and what I would be doing there. I told them I had just been to a small school in the woods, whose name I had forgotten, but where I was hoping to teach. As it turned out, both of these men were teachers at that school, which was called Sada Shiva Primary. The man in the V-neck sweater introduced himself as Govinda Prasad Paudel, the English teacher. 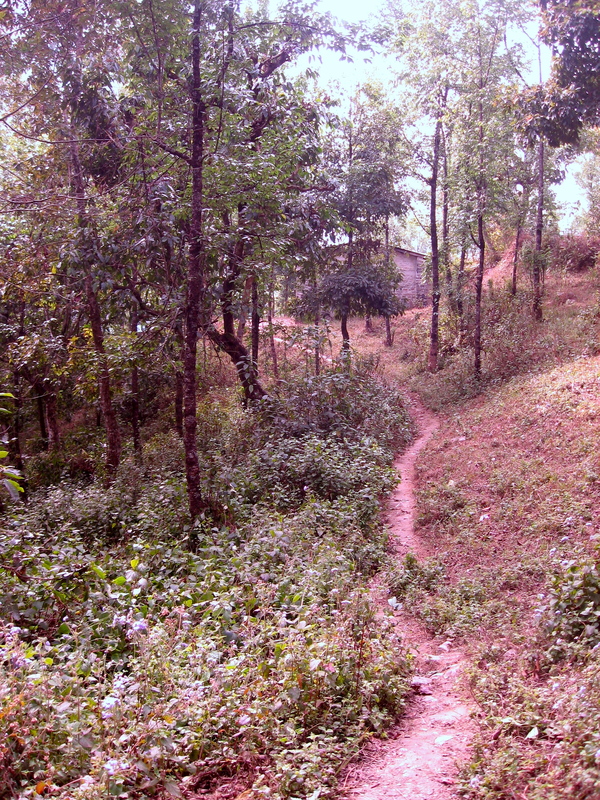 For the next two and a half months Govinda and I walked the wooded path back from school together every day. During that time our friendship was formed, and instead of calling each other by name, we began to follow the Nepali tradition of addressing one another by a familial relation. I called him daai, or “older brother,” and he called me bahini.